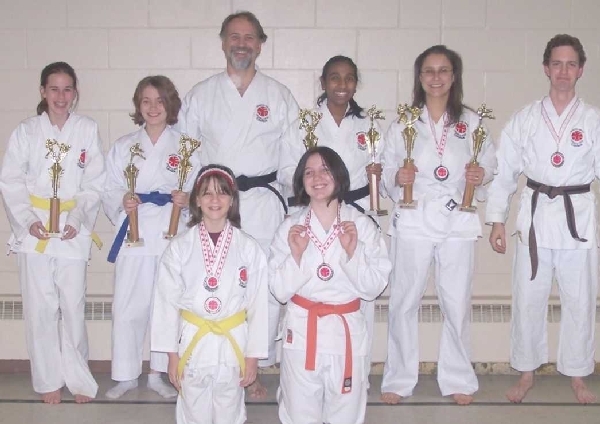 In the summer of 2015 the Deep River Karate Club held a weekend karate retreat in the outskirts of Deep River. For information see the retreat page. Gradings, also called rankings, occur twice a year. The gradings are a joint event with the sister club from Pembroke under Mark Stevens Sensei. The fall grading is typically in late November or early December and in Deep River. The spring gradings are usually late May or early June in Pembroke. 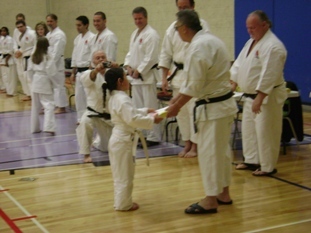 Only students recommended by their sensei attend a ranking. The senseis will advise those students of date, time and location. 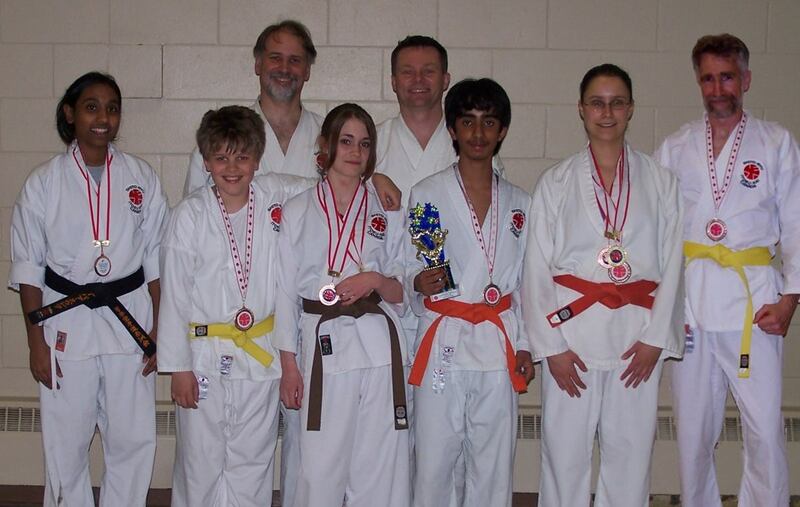 Photos from the fall 2008 ranking at Mackenzie High School in Deep River. Deep River and Pembroke karate-ka anxiously waiting to start. 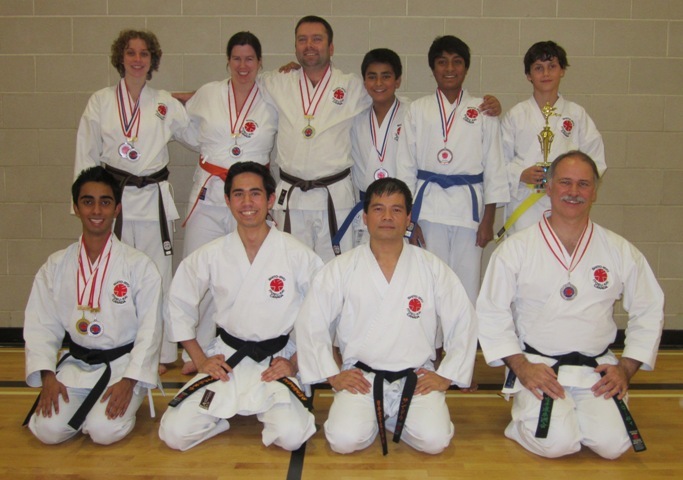 Successful Pembroke student receives obi from Chief Instructor for Canada, Kei Tsumura Shihan. Looking on (R-L) are Bo White, head sensei Markdale dojo; Mark Stevens, head sensei Pembroke dojo; Ken Chaplin, head sensei Deep River dojo; Daniel Tsumura, head sensei honbu; and senseis and sempeis from Toronto, Pembroke and Deep River. 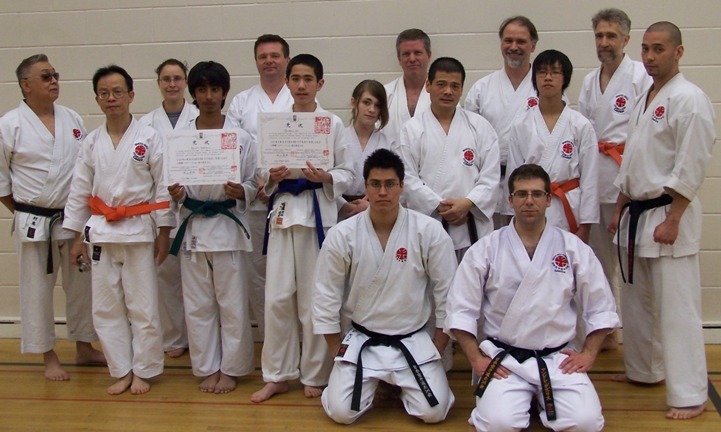 Deep River students along with Tsumura Shihan, Chief Instructor for Canada (far left) and visiting senseis from Alberta and Toronto (kneeling and far right). Turn left (north) onto Wynford Dr. The next tournament is May 24, 2014 at JCCC. 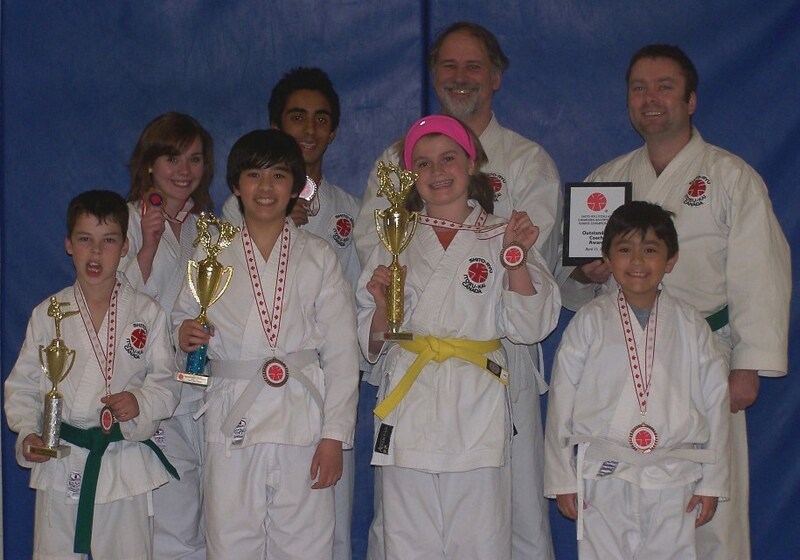 Deep River team members in the Fall 2013 tournament. 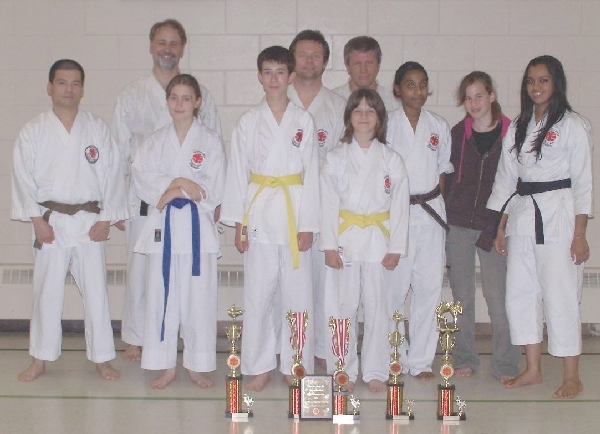 Back Row: Audrey H., Angela W., Chad B., Ethan K., Akila S., and Daniel F.
Front Row: Kevin K., Michael D., Andrew D, and Ron R.
These Deep River members competed in kata, team kata, sparring (kumite) and performed demos. 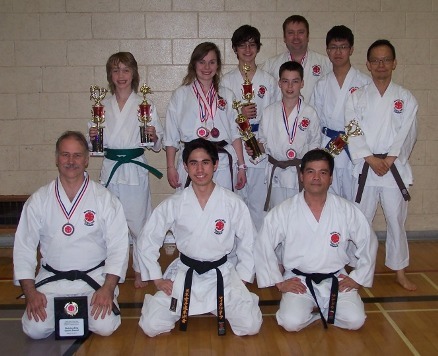 Deep River team members in the Spring 2013 tournament. 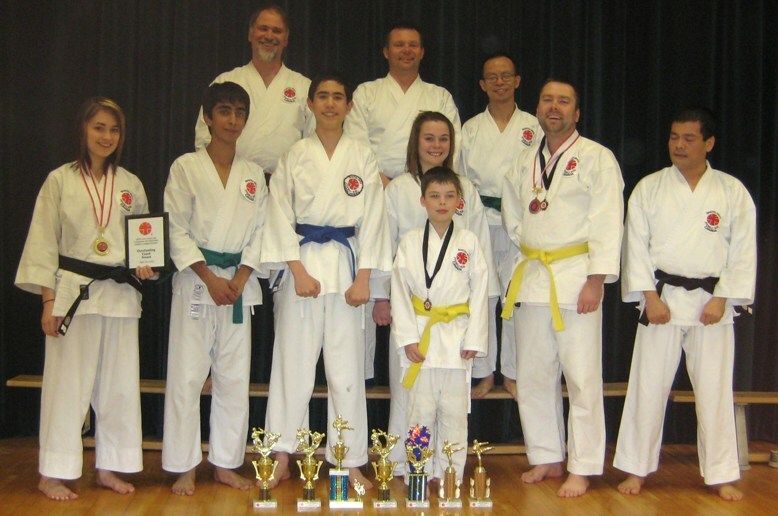 Back Row: Kody S., Kasja-Dawn S., Matthew K., Chad B., Darren C., and Jim C.
Front Row: Ron R., Michael D., and Andrew D.
These Deep River members competed in kata, team kata and sparring (kumite). 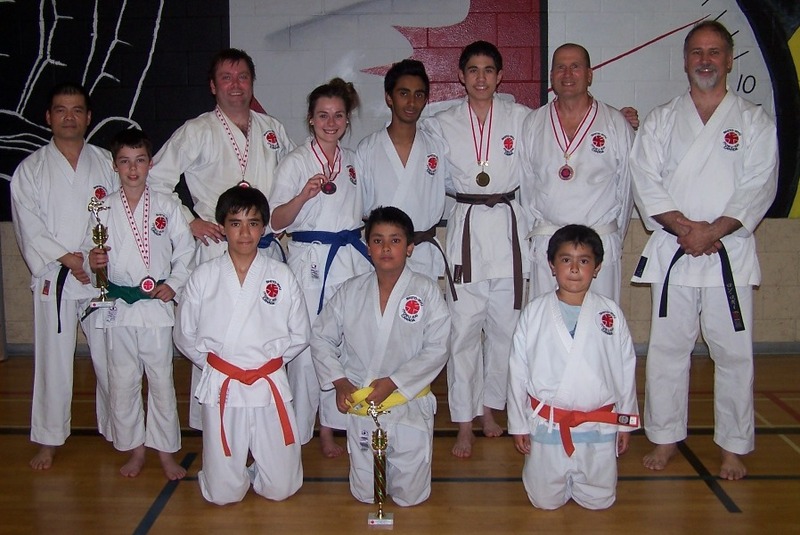 Deep River team members in the Fall 2012 tournament. 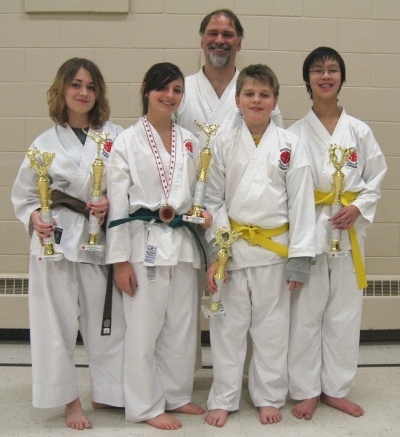 Amber B., Anna Li, Athalia V., Laura W. and Lucas C.
Deep River team members in the Spring 2012 tournament. Standing: Andrew D., Andrew S., Chad B., Kasja-Dawn S., Kevin K., Michael D., Dan C., and Ron R.
Kneeling: Mark G., Ethan K., and Eric G.
Deep River team members in the Fall 2011 tournament. Ron R., Dave H., and Matthew K.
Deep River team members in the Spring 2011 tournament. Back Row: Kasja-Dawn S., Kevin K., Ron R., and Chad B. Front Row: Andrew S., Mark G., Grace G., and Eric G.
Deep River team members in the Spring 2009 tournament. Back Row: Ron R. Roman P. and Jim C.
Front Row: Renee R., Kevin K., Mike D., Chad B., Kasja-Dawn S., and Andrew D.
Missing from the photo is Justin C., Andi S., Jamal M.
Back Row: Ron R., Roman P. and Bruce S.
Front Row: Roopa S., Nicholas R., Renee R., Kevin K., and Helene H.
Left to Right: Renee R, Stephanie W., Ron R., Nicholas R., and Justin C.
Missing from the photo is Yoseph J., who on the day following the tournement, successfully ranked for his 1st degree black belt. 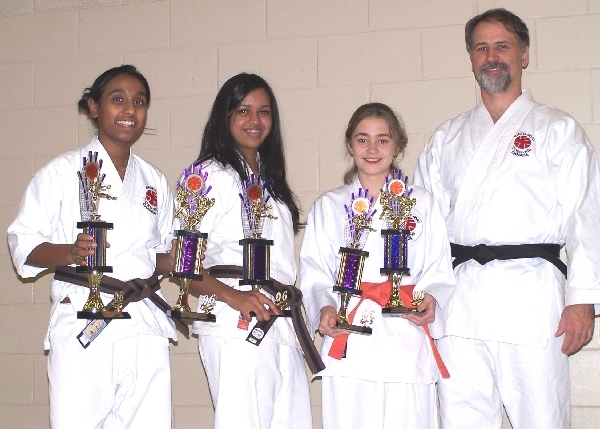 These Deep River members competed in kata and sparring (kumite). No photo is available of the Spring 2008 team. Team members were: Yoseph J., Alex O., Renee R. and Ron R.
Deep River team members in the Fall 2007 tournament. Back Row: Katie H., Renee R., Ron R., Roopa S., Helene H. and Alex O. Front Row: Natalie G. and Taylor G.
Back Row: Ron R., Roman P. and Ken C.
Front Row: Andrew D., Renee R, Ewan C., Natalie G., Roopa S., Katie H. and Sangeeta S.
Deep River team members in the Fall 2006 tournament. Roopa S., Sangeeta S., Renee R, and Ron R..